While some bands were experimenting with their sound on the road to playing heavy metal, Motorhead was one of those bands who already knew where they were heading in 1979. “Overkill” was the first of two albums put out by these guys in the year the dam began to burst. 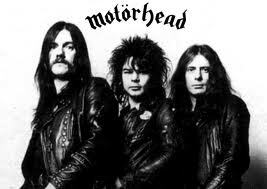 Unlike Led Zeppelin or Duran Duran or the Spice Girls or Wham or JLS, nobody in America ever said that Motorhead was the best thing to come out of England since The Beatles. This is in spite of the fact that, with the exception of Led Zeppelin, they stomp all over the other mentioned names. Not that Motorhead would actually give a sh*t about that to begin with. Again, it would be several more years before they came to my attention so this is yet another of those albums I listened to in retrospect. Still it is everything I would later come to know and love about them. “Overkill” is a metal album that put several cracks into that bursting dam. Every song says to me, “I’m going to make your ears and nose bleed and you’re going to like it.” Therefore, it is difficult for me to pick out any one or two tracks that stand out. For me, when every song is that good, it makes for one hell of an album. With “Overkill,” I can see the birth of thrash and speed metal for these guys helped pioneer it. Everything from Lemmy’s gutteral vocals and thumping bass to the great guitar work of Fast Eddie Clark and yes, I’m going to add him to the list of underrated guitarists. Of course it is all to the beat of Phil “Philthy Animal” Taylor on the drums. This album is a promise of great things to come. While I have been writing this post, I’ve been hoping a song would stand out for me. However, when one pops into my head so does another in direct competition, so no, there is not one song that stands out because they all do. That makes a good album and for many in 1979, it would be an indication of greater things to come. This entry was posted on February 28, 2013 at 7:43 pm and is filed under 1979, Heavy Metal, Music, Rock, Uncategorized with tags British, Classic Rock, hard rock, Heavy Metal, Motorhead, Overkill, speed metal, The 1970s, Thrash Metal. You can follow any responses to this entry through the RSS 2.0 feed. You can leave a response, or trackback from your own site. Oooooooooh. Nice. I got into this album in retrospect as well. It’s just great. 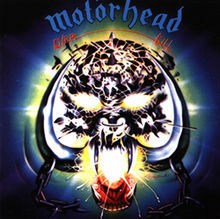 From sound to songs, it’s a perfect Motorhead album. I think Metallica covered at least two of these songs (maybe 3) on their Motorheadache EP. It’s up there for me as well, thanks. Completely agree that you can’t pick a track from this lot! I have to admit, this album has got me listening to them again, something I hadn’t done for a while. Hell yeah it is! My favorite, oddly enough, is Bastards. That album has Burner (my favorite Motorhead song) and that bizarre song where Lemmy sings from the perspective of a little girl. Amazing stuff! It will be a long time before I get to Bastards as that album was released in 1993 and I’m still 14 years away from it. But I will say it’s amazing stuff. Thanks for the follow and I hope you’ll like my future posts. I think I may be a bit of an odd-man-out, but even though Overkill is absolutely excellent, I can’t get behind either “Capricorn” or “Metropolis” at all. Don’t know why put they just put me right off. Everything else though, flawless. Such good songs.